My most recent works are in oil paints. It's been such a joy to explore another medium to create original works of art. So right now, I'd like to introduce you to "Take A Bow" my first oil original art. And there are more to come. 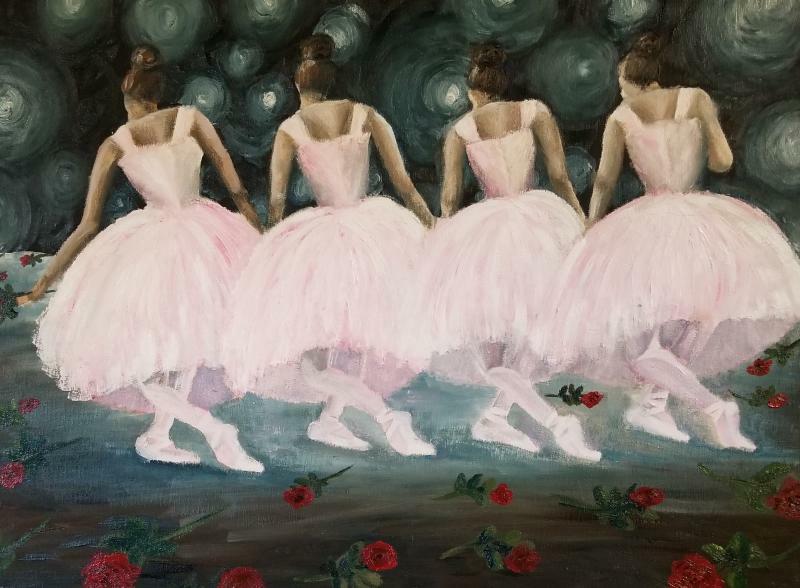 Created: 2018 Size: 18" x 24"
Ever see a live performance at the ballet and leave feeling rejuvinated and excited that you were there? That was what inspired this ballerina scene. Looking onto the audience, clapping, cheering and flashing lights of cameras. The audience throwing roses on stage to the performers. And the ballerinas on stage, giving it there all, then as they are about to exit, they all hold hands to take a bow. I just fell in love with this piece as I created her and the images are really good and are a true representation of all the colors, but when you see this piece in person, it really comes to life.